I really like red foods. When I see a juicy red pasta sauce or a nice hot red soup, I want to dig in immediately! 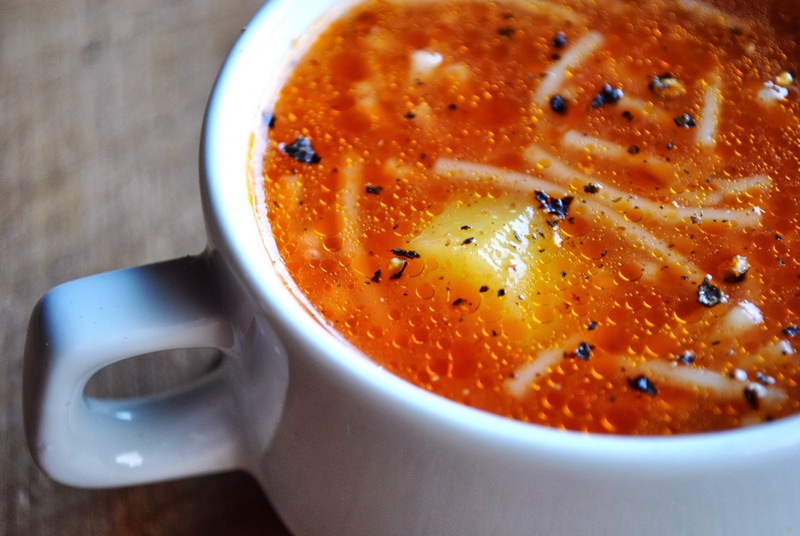 This soup is almost too simple. Perfect if you are in a rush or just want to take it really easy and not to waste too much time to cook a nice meal. I added a lot of garlic, if you're not really into garlic then feel free to reduce the amount. Heat up some oil in a thick-bottomed pot. Add chopped onions and cook until slightly golden brown. Add chopped garlic, stir and pour in the water. Add ground black pepper and vegetable stock powder and/or salt to taste. When the water is boiling, add noodles and potato cubes. Boil for 5 minutes. Add tomato juice and boil until the potatoes are soft.